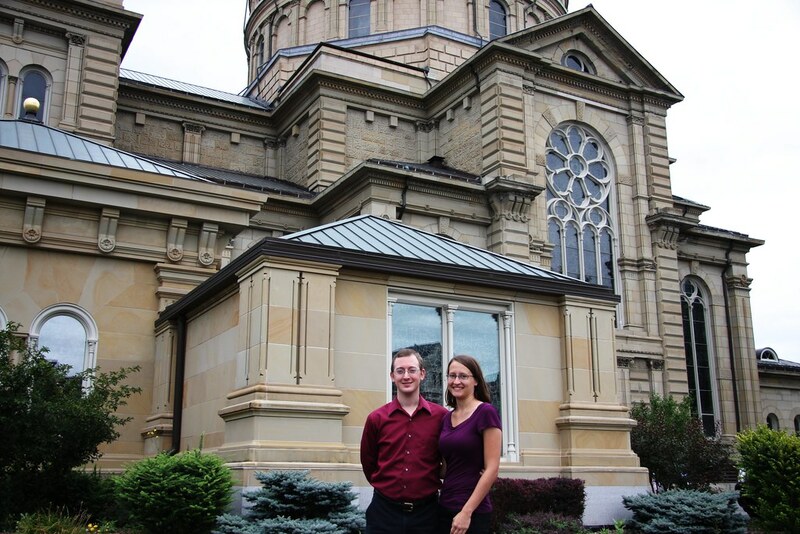 My boyfriend and I had the pleasure of visiting the Basilica of St. Josaphat in Milwaukee, Wisconsin on September 4. 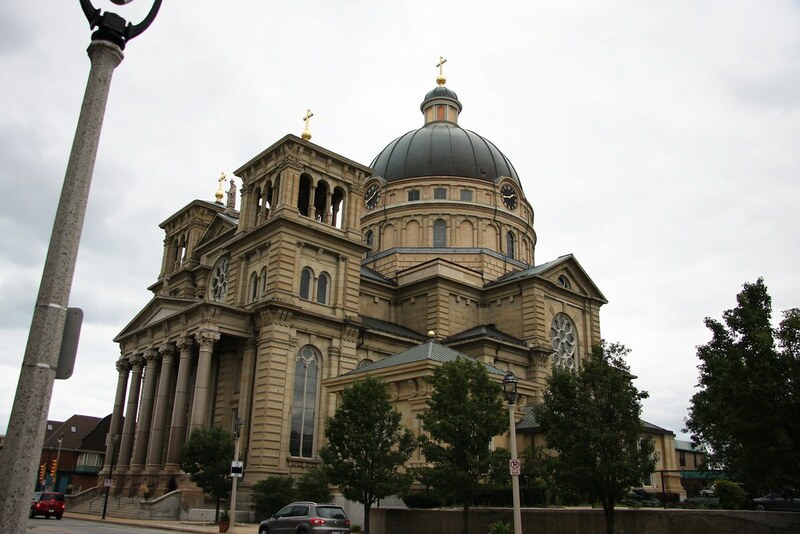 Milwaukee seems to have a gorgeous church around every corner – St. Anthony’s and St. Stanislaus are mere blocks away – but St. Josaphat’s is the crown jewel. This church is rich in history, with symbolism lurking around literally every corner. We chose a Sunday to visit, since the only tour of the basilica occurs after the 10 AM Mass. We showed up around 9:30 and went into the Pope John Paul II Pavilion, a building connected to the church that is used as a visitor’s center. While waiting around, an elderly gentleman walked out of Mass to where we were loitering. He sat down, asked if we were visiting (probably because of my camera) and started telling us all about the history of the parish, as well as the history of nearby parishes (and even a few in Chicago!). Mass ended much later than we anticipated – nearly a half hour late. The cause was that the Bishop of LaCrosse (a neighboring Wisconsin diocese) was celebrating. Since the tour started much later, we were only able to attend the first fifteen minutes or so before attending Mass ourselves. The history of this church is certainly a lesson in perseverance and relying on God’s grace. The first St. Josaphat’s was built in 1888 and destroyed by fire within a year. A second church took its place, but was declared too small for the rapidly growing Polish population. 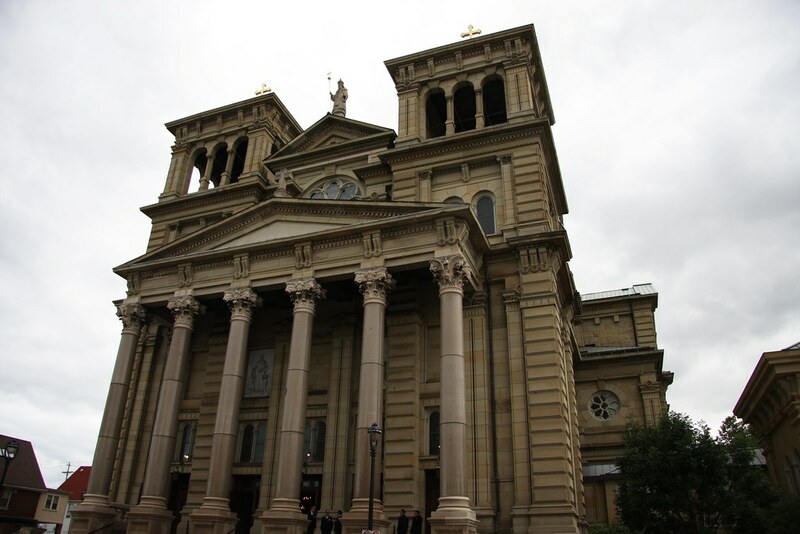 The St. Josaphat’s we now have was planned in 1895, the first cornerstone laid in 1897, and eventually dedicated in 1901. Father Wilhelm Grutza, who oversaw the entire project from inception to completion, passed away five weeks after the dedication. As you can imagine, Polish immigrants coming to Milwaukee at the turn of the century had little money to give to St. Josaphat’s construction efforts. The community scraped together what they could. Additionally, the parishioners did most of the excavating (by hand and horse power) and building, such as mixing and pouring the cement. One of the most interesting facts about this church is where the building materials came from. Given the relative financial poverty of the parish, the church was looking for any deal they could find. In 1896, Father Grutza learned that the Chicago Post Office and Customs House was being demolished due to unstable construction. Built for $4 million, Father Grutza paid $20,000 for the salvaged materials and had them transported to Milwaukee on 500 railroad cars. The entire building was redesigned to work with the new materials, almost none of which went to waste. All of the sandstone was used to construct the church, and the plans were redone to incorporate the columns from the post office. 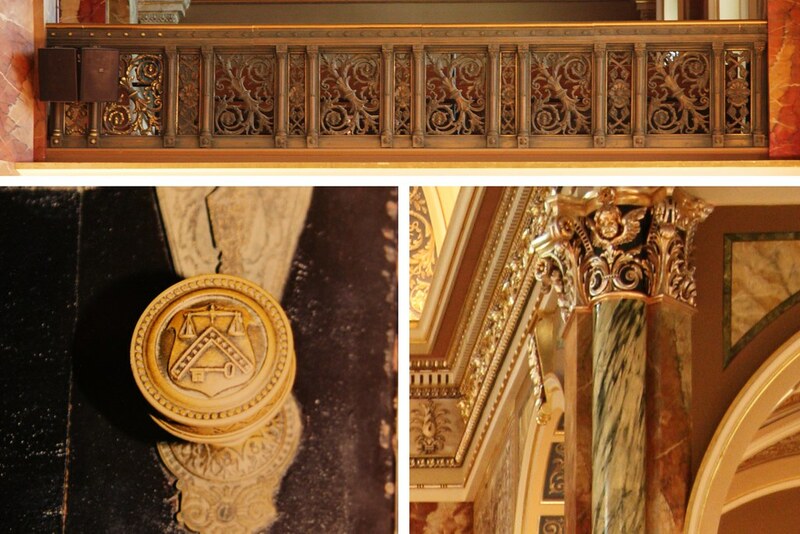 The railings from the post office were incorporated into the choir lofts. Even the doors were taken; you can still see the post office insignia on the knobs. Although the church was dedicated in 1901, the interior walls were completely unfinished. The parish was under a considerable amount of debt, despite all of their labor, and was eventually turned over to the Conventual Franciscan Friars, who assumed 80% of the debt. Finally, in 1926, the interior of the church was decorated. Around 6,500 hours were logged to paint the inside (over 10,000 were logged to restore it several years ago). You’ll have to forgive me as I go through the artwork; this church has an incredible amount of detail, and I’m bound to miss several points. While every stretch of wall is fascinating, I want to highlight a few of my favorites. First, the mural behind the altar is of the martyrdom of St. Josaphat. It’s difficult to see in my photos unfortunately. But if you’re ever there, check it out. Second, since the interior was decorated after the Franciscan’s had assumed responsibility of the church, there are eight murals (two in the corners above each of the four pillars beneath the dome) depicting the life of St. Francis. The interior of the dome is probably the most intricate in terms of the level of detail. 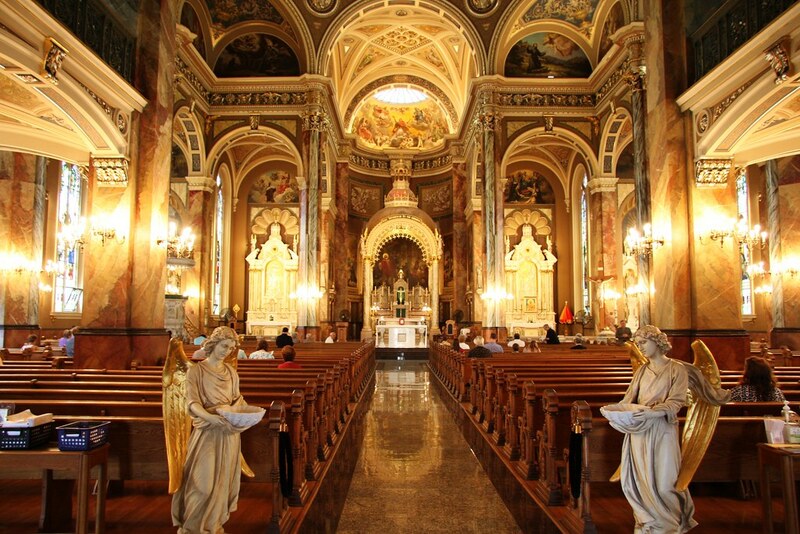 You may have noticed by now a bit of St. Peter’s in the design of St. Josaphat’s. The place this comes through the most is the dome. The fifth largest copper dome in the world when it was built (and still one of the larger ones), it is subdivided into eight sections similar to the dome at St. Peter’s. Likewise, it also follows a blue and gold color scheme. As I go through the various parts of the dome, I’m going to start at the apex and work out. 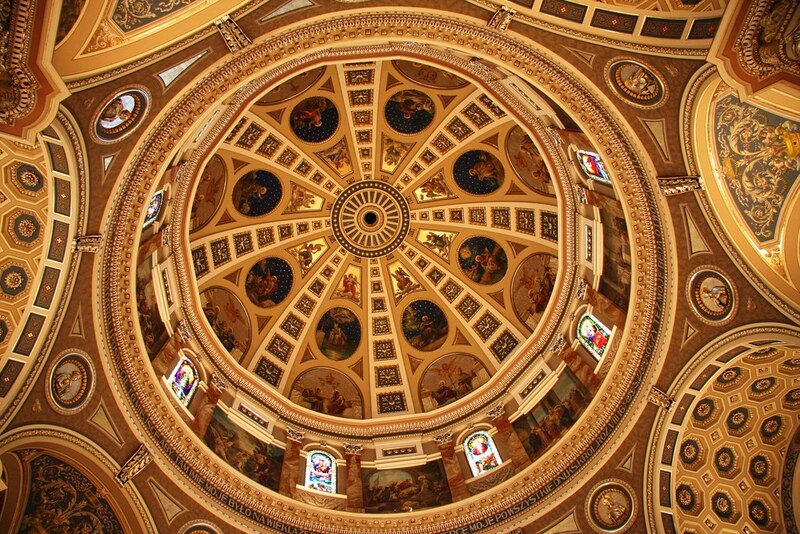 The decorations inside the dome are meant to represent the magnitude and fullness of the Catholic faith, so there’s quite a bit to see! The next picture can be enlarged on Flickr to help follow along. The very center of the dome is a three inch piece of crystal, which can be opened during the summer months to assist with airflow. The first set of pictures (shown with gold backgrounds, just above the blue circles) depicts the eight divisions of angels, sans the archangels, which are behind the altar. Next, the blue circles feature the eight Old Testament prophets who foresaw the coming of Christ: (going counterclockwise, starting at roughly seven o’clock) Moses, Joshua, Jeremiah, Daniel, Amos, Jonah, Isaiah and Elijah. Beneath the Prophets are the Apostles and select Doctors of the Church. Starting just below Moses and going counterclockwise: Saints Peter and Paul; St. Mark with St. Alphonsus Ligouri; St. John the Evangelist with St. Gregory the Great; St. Bartholomew with St. Jerome; St. James the Younger with St. Augustine; St. James the Elder with St. Thomas Aquinas; St. Luke with St. Ambrose; St. Matthew with St. John Chrysostom. The next ring features alternating paintings and windows. The windows (made in Switzerland) are of various apparitions of Our Lady, all of which are related to Poland and eastern Europe. Starting just below Saints Peter and Paul and going clockwise: Our Lady of Czestochowa; Our Lady of Ostrobrama; Our Lady of Mercy; Our Lady of Zebrzydowa; the Coronation of the Blessed Virgin in Heaven; Our Lady of Pinsk; Our Lady of the Sands in Krakow; Our Lady of Gidle. 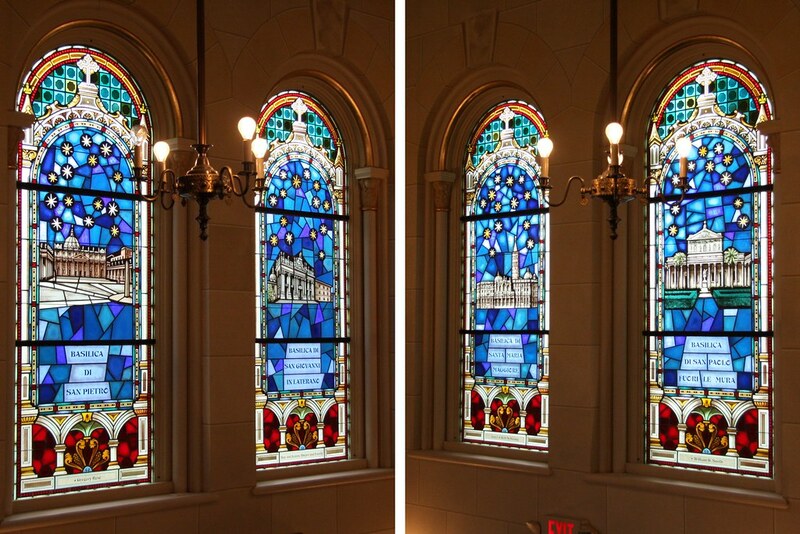 The pictures in-between the windows depict Christ’s nativity and the seven sacraments. Next, there are words written around the dome in Polish (you can see some of them on the bottom right of the dome in the picture below) are from 1 Kings 9:3: “I consecrate this house you have built. I place my Name here forever. 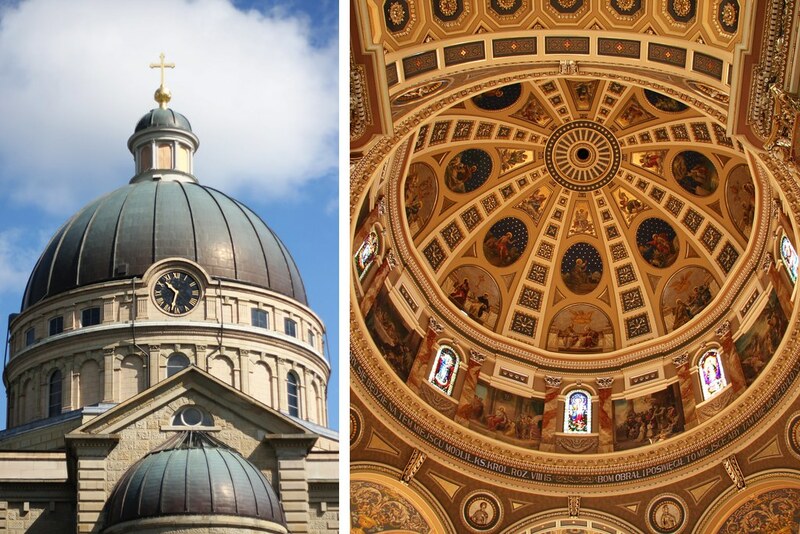 My eyes and my heart shall always be here.” Finally, the medallions around the dome (five of which can be seen in the picture below) are of various saints, including St. Louis, St. Hedwig, and St. Vincent de Paul. Finally, if you’re facing the back of the church, there are two very large murals, one one either side of the choir loft. Unlike the rest of the artwork in the basilica, these two murals are much more grounded in secular events. The first shows Pitor Skarga (a Jesuit priest) preaching for a reformation of the ways of the nobility in Poland. Skarga is also well known for being instrumental in reuniting the Ruthenian Church with Rome. The second one (my personal favorite) shows Tadeusz Kościuszko, a Polish-Lithuanian man who is considered a national hero to Poland, Lithuania, the US, and Belarus. He is amongst several troops, and it reminded me vaguely of Washington Crossing the Delaware, but on land. Only three years after the interior decorating was complete (in 1929), St. Josaphat’s became the third basilica in the United States. 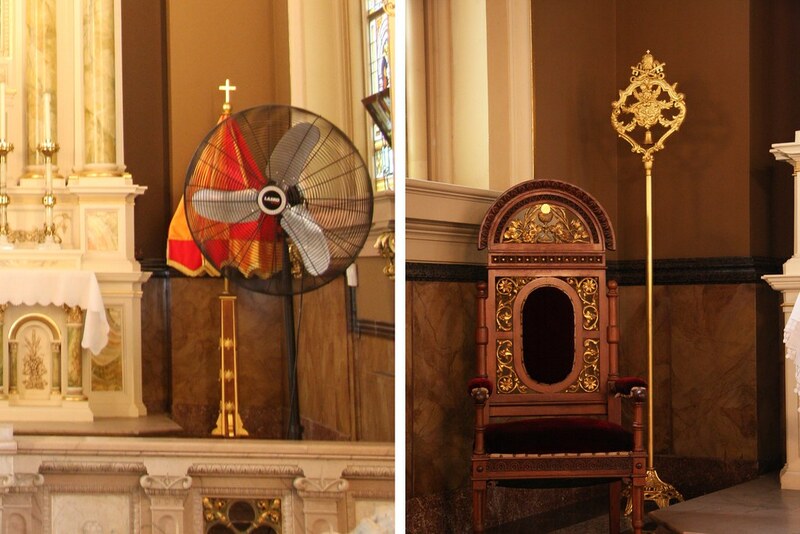 You can see the umbraculum (artfully hidden by the fan) and the tintinnabulum (next to the bishop’s chair) below. There’s a lower church in the basement of the basilica, connected by the Pope John Paul II Pavilion (more on that later). The lower church contains a smaller altar, a shrine depicting Our Lady of Lourdes, and relics. The elderly gentleman mentioned earlier had explained to us how the relics used to be available for public viewing, but after someone stole the statue of the Blessed Virgin (which was eventually recovered), they decided to keep all of the relics behind a locked gate. 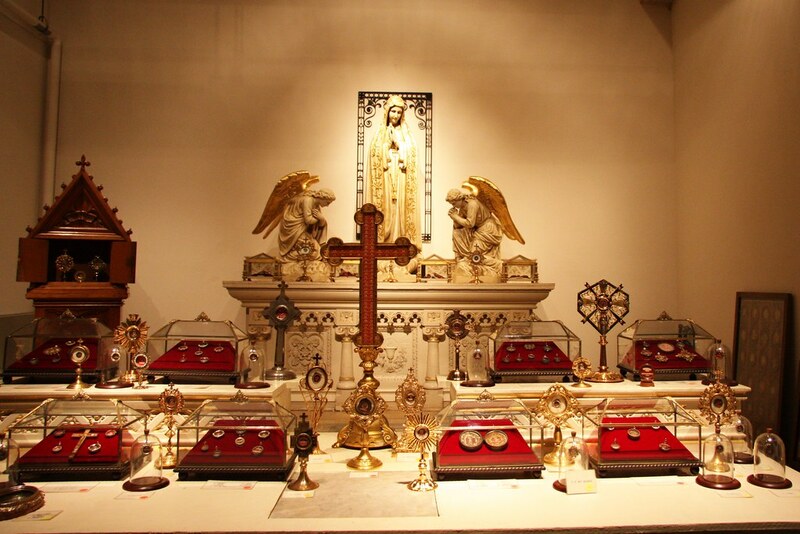 You can see the gate in the above picture; the following is most of the relics on display, taken through the gate. Connecting the lower and upper basilicas is the Pope John Paul II Pavilion, which opened in 2000. The walkway between the two features well-known Franciscan saints and places, such as the basilica in Assisi. 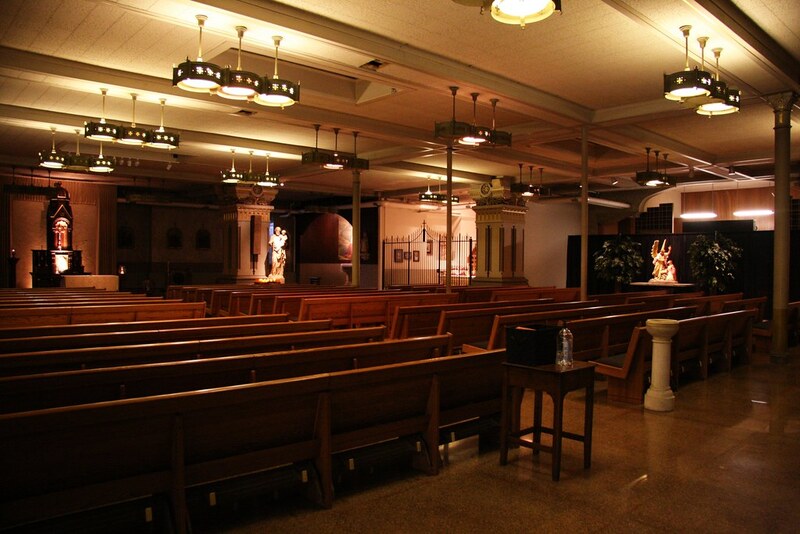 The lower portion features a wall display giving the history of St. Josaphat’s. A reception area in the pavilion sports stained glass windows of the four major basilicas in Rome. Across the street is the Lil Friar Basilica Gift Shop. Independent of St. Josaphat’s, it is nevertheless a fixture of the basilica’s community. And look! There’s us! The day started out nicely, and it got prettier later on, but when we went to take the picture, we had to settle for the overcast skies. Beautiful! Thank you so much for your post. I will have to find an excuse to take a trip to Milwaukee and visit. I found your blog a little bit before your hiatus and I’m really enjoying it. I’m especially looking forward to your next post on Holy Hill because my husband and I were supposed to visit last weekend (and enjoy some great fall leaves! ), but I got sick. Sounds like Milwaukee is just like Chicago…beautiful churches everywhere! I’m particularly fond of the Polish Cathedral style ones that line the expressway down here, though St. Mary’s dome is encased by scaffolding, the interior of St. John’s is undergoing restoration, and St. Stan’s needs some work, so now might not be the best time to visit. However, Holy Trinity, just down the street from St. Stan’s, is amazing. It’s now a mission for Polish immigrants. I was able to visit on Holy Thursday this year and it’s gorgeous inside (http://trojcowo.com/teksty/07wnetrze.html). It also seems to have a controversial history. I also got to visit the Basilica of St. Hyacinth on that pilgrimage, but their mass was running really really really late, so we only were able to peer around from the back. Based on the research I did of Chicago, I would say your assessment of the two cities is accurate! I suspect the Chicago basilicas will be some of the next few we visit. Also, St. John Kanty – the man who talked with us at St. Josaphat’s had high praise for it! Hopefully you can get out to Holy Hill sometime. We had intended to go last fall and then again this fall to see the colors, but that never happened – we settled for the green. It’s close enough to me though that we can make it out there again some fall. 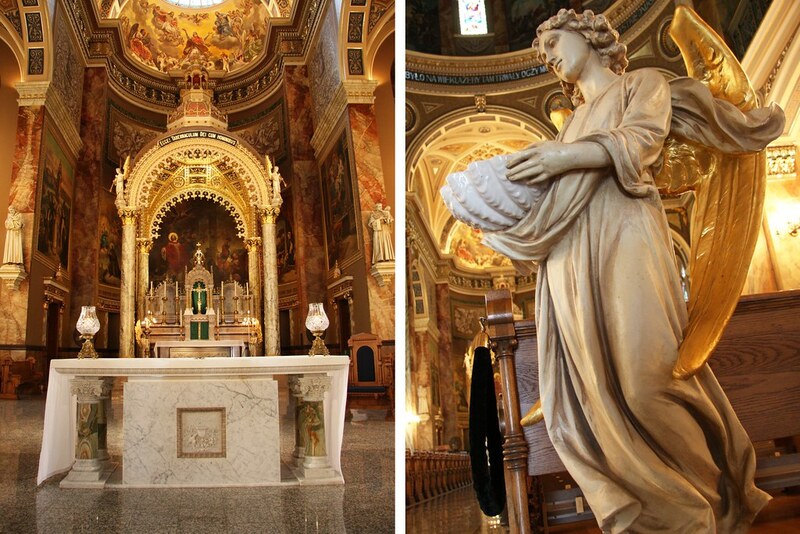 If by St. John Kanty, you mean St. John Cantius, then yes, it’s awesome…but I’m biased, since it’s my parish. 🙂 Fair warning: they’re in the process of doing some restoration inside the church, so there’s lots of scaffolding and plastic sheets draped over things. Among other things, they had to replace a major support beam that had disintegrated due the caustic effect of literal tons of pigeon droppings left over from when they raised pigeons in the attic during the depression. (There’s a video with our pastor telling that story, but I can’t seem to find it.) They’re also going to be refurbishing and installing a historic organ, to be done in 2013. Oh my goodness… how beautiful! Thank you so much for letting me ‘travel’ through the gorgeous photos and your writing! The history is amazing! Wow, every picture is breath taking!! I bet you walk into a place like that and really pat yourself on the back for taking these trips with your boyfriend!! 😀 You know, it can be a little hectic planning them since we only see each other every other weekend, but once we get underway, it’s a wonderful adventure we’re lucky to be able to share! We’re both fond of the memories.